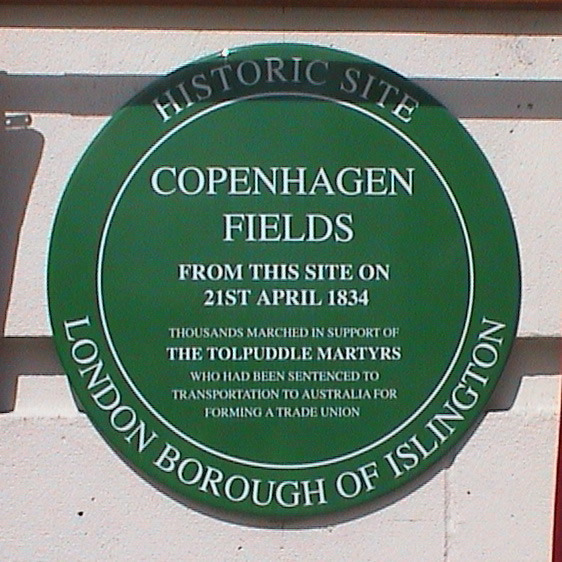 From this site on 21st April 1834 thousands marched in support of The Tolpuddle Martyrs who had been sentenced to transportation to Australia for forming a trade union. 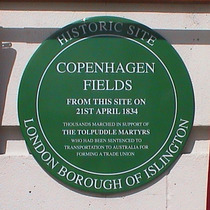 We attended the unveiling of the Tolpuddle plaque on 25 April 2009, the 175th anniversary of the march, and took the photographs at the event. The tower is all that remains of the Caledonian Cattle Market, built in 1855 by J. B. Bunning, and demolished after WW2. 2013: The tower might be opened to the public, but meanwhile A London Inheritance reports on a visit. Another London Inheritance post does an excellent job with the history of the site. Elizabeth Barrett Browning (1806 - 1861) - poet - lived here.L.C.C.